"It is what it is", is a sentence you can be certain to hear every time you get to talk with Valtteri Bottas or Kimi Raikkonen. More than the other drivers, the Finns are extremely pragmatic people, who don't dwell on what should, could or might have been. What matters for them is the present and the future, because there's nothing they can do to change the past. Because of their typical Finnish mentality, Bottas and Raikkonen come across as cold characters, devoid of passion or inner fire, but nothing could be further from the truth. Listen to Raikkonen's fiery radio rants when he's unhappy with his team or other drivers and you know he's a man who cares passionately about what he's doing and wants to do it well. Bottas is far less vocal than his elder countryman but if he tries harder to keep his emotions in check, his facial expression and body language easily tell you what's going on inside his head. Sunday afternoon in Sochi, the younger Finn was a very, very unhappy man at the end of the race and, in fairness, he had every reason to be furious. Beating Lewis Hamilton fair and square is no easy task, particularly when, as now, the English driver is at the top of his game. 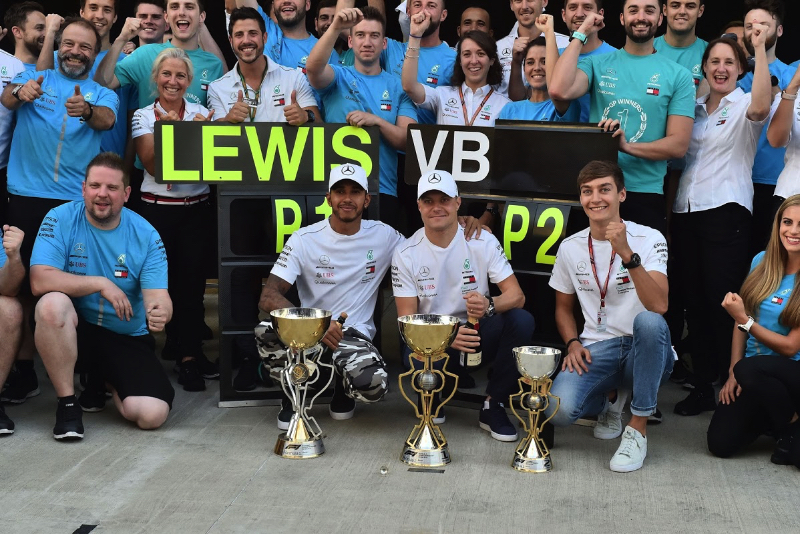 But Bottas had the measure of Hamilton both in the decisive qualifying session and in the race, so he fully deserved to win the Russian Grand Prix, as the championship leader acknowledged at the end of the race. No wonder, then, Bottas took an eternity to remove his helmet after getting out of his car, as he was trying to process his emotions and make sure his anger wasn't too obvious once the helmet and balaclava came off. He even took the time to, still with helmet on, go and check Hamilton's left rear tyre, having been told it was blistered and that's why the Brit needed to be protected from Vettel's attacks. As it was, the blister was minimal and that certainly didn't do much to ease Bottas' pain. His disappointment was obvious from the Parc Fermé all the way to the many post-race interviews he had to attend, even after Hamilton and him spent quite a bit of time on their own, immediately after the podium ceremony, to clear the air without any witnesses. That left Sebastian Vettel - who always takes his time to change into civies before meeting the press - on his own with the journalists a good five minutes - before the Mercedes pair entered the Press Conference room. Only a couple of hours later, after listening to Mercedes' reasons in the technical debrief, was Bottas able to crack a smile, showing he had come to terms with what he had been forced to accept. Time and again he repeated that, "from the team's point of view, as long as we finished one-two and got maximum points, it didn't matter who would win, but Lewis is fighting for the championship while I'm not, so I understand their reasons." What seemed more difficult to swallow for the Finn was the way the whole scenario unfolded. I have reasons to believe Mercedes had always told the Finn he would be free to race and win, even with Hamilton in second place, but would be asked to drop behind his team mate if he wasn't leading the race. That was quite commendable from Mercedes because giving away a victory is a big ask, while dropping from second to third place doesn't really matter for someone who's not fighting for the title. That being the case, Bottas, as promised on Saturday afternoon, was "going for the win" once the race started, fended off Hamilton's attacks into Turn Two and then pulled away from his team mate. Keen to prevent being caught out by a possible undercut, Mercedes had him in for new tyres one lap before Vettel and two before Hamilton, knowing Bottas would return to the track behind Verstappen and would have to pass the Dutchman quickly, as the Red Bull driver was going to go past lap 40 before putting softer tyres on. As soon as the top three changed tyres the scenario started to change, for Mercedes' decision to delay Hamilton's stop by one lap backfired and he dropped behind Vettel. So, instead of being told to go for it, pass Verstappen and pull away, Bottas was instructed to back into Vettel and delay the Ferrari driver to facilitate a move from Hamilton. He duly complied and it was because he'd slowed the German on Hamilton's out lap, that the championship leader was in a position to attack his rival and then pull that stunning move, around the outside of the daunting Turn 3 corner and completing it under braking for Turn 4, slotting behind his team mate. Having done what he'd been asked, Bottas was then instructed to start pushing and pass Verstappen, so he quickly started to cut the gap to the Dutchman, believing he was again free to race for himself. But Hamilton's left rear tyre had been damaged by that massive push on the two laps after the pit stop and, weary that Vettel could pass him back, Mercedes ordered the Finn to allow his team mate through, which he promptly did, not before letting his engineer know that, "I'm just one and a half laps away from passing Max!" Even though, Bottas did what he was asked but knowing how the whole situation unfolded, it's easy to understand why he said, a few times after the end of the race, "the communication was confusing", which contributed a great deal to his anger as he got out of his car. Team orders, as I wrote in this same column quite a while ago, are as old as motor sport and if you follow it, you have to accept it. I'm not going to lie, I don't like team orders, I get quite upset when a driver is prevented from winning a race he deserved to conquer and it's particularly galling for Bottas, who's yet to win a Grand Prix this season, to let this one get away. At least three times in the early stages of the season the Finn could or should have won but that never happened. In Bahrain, he was released too late by his team and ran out of laps to pass Vettel for victory; in Shanghai he was defeated by the Virtual Safety Car period that helped Ricciardo go from 5th to first and in Baku a puncture, with two laps to go, took away a certain win.